Svatá Ludmila - Antonín Dvořák - Mediální ohlasy - ArcoDiva management - Hudební agentura - Hudební agentura ARCO DIVA Management s.r.o. Dvořák’s oratorio St Ludmila resulted from his continuing association with England, and with the Leeds Festival in particular. He made no fewer than eight trips to England, and the results were important artistically as well as professionally. For example, his ability to respond to the country’s burgeoning choral tradition led him to compose a magnificent Requiemfor Birmingham, where the authorities also suggested that for their 1890 event he might compose a setting of Cardinal Newman’s poem The Dream of Gerontius. He thought carefully about doing so, and then decided against it, which from the point of view of posterity was just as well. 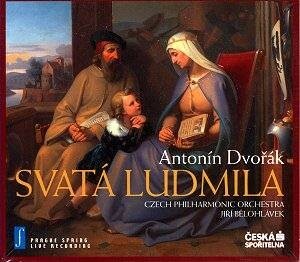 St Ludmila is a work of Dvořák’s maturity, and the most likely reason for its failure to establish a regular repertory position is its size and scale. The performing time is some two hours, and the resources required are large and complex. Neither of these considerations represents an impossibility, but on the other hand, neither exactly helps when it comes to making performances possible.